Make sure that the HS3 software is not currently running. Making the changes below while HS3 is running will not resolve the issue. 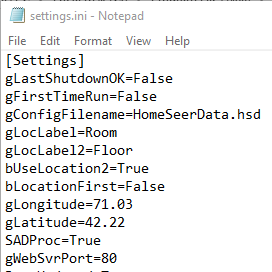 Open the settings.ini file with NotePad and change the gWebSvrPort port setting to '88' (or some other number). If the gWebSvrPort setting doesn't exist, just create it as shown below. Save and close the settings.ini file and start HS3 again. The web server should work now. *Disable your firewall for any other continued web server issues.